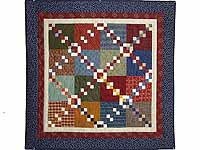 A terrific quilt to celebrate the 12 days of Christmas! Guaranteed not to drop its needles. 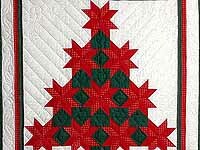 Nice Christmas colored fabrics, great piecework and quilting. Made in Lancaster by an Amish woman. Includes a sleeve for a hanging rod. 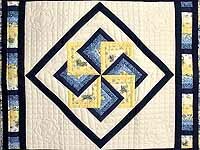 A charming small classic quilt that can be used as a throw or wall hanging. Lovely fabric selections. Nicely made by Lancaster County Amish woman. A classic design, very strong, sharp, bright, almost austere. 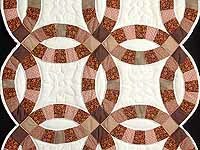 Excellent piecework, fine quilting, look at the stitching. Made by local Amish woman. Wow! A wonderful throw for those cold winter evenings, or a great warm burst of color for a wall. 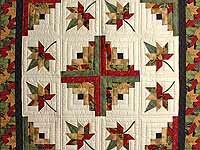 Note the brilliant country style fabrics and the special border treatment. Made here in Lancaster by an Amish woman. A sophisticated take on the Star Spin design with extraordinary coloring. Note the delicate background fabric and the special Roman Stripe border treatment. 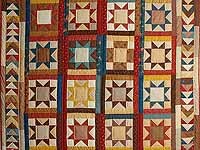 Well made by Amish woman in her Lancaster County home. Includes a sleeve for a hanging rod. Terrific! 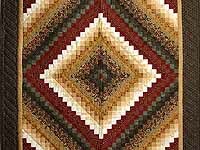 Large enough to use a throw or a striking wall hanging. Great combination of two favorite designs with lovely autumn coloring. Note the fine background print. 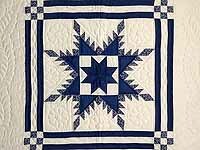 Well made by Amish woman in her Lancaster home. Includes a sleeve for a hanging rod. Great choice for that new baby boy! 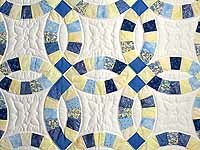 Excellent fabric selections, well made with fine piecing and quilting. 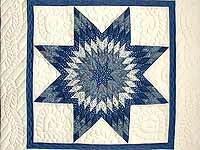 Made by Lancaster County Amish woman. Includes a sleeve for a hanging rod along one of the short sides.